Rt Hon Vince Cable MP, Secretary of State for Business, Innovation and Skills was in Burnley today (27 February 2014) to officially launch Burnley Bridge Business Park. Mr Cable enjoyed a tour of the 70-acre development site, before unveiling a commemorative plaque to mark the official launch of the £50 million business park. Located at Junction 9 of the M65, the development is the flagship project for Leeds-based commercial property development and investment firm, Eshton Ltd. 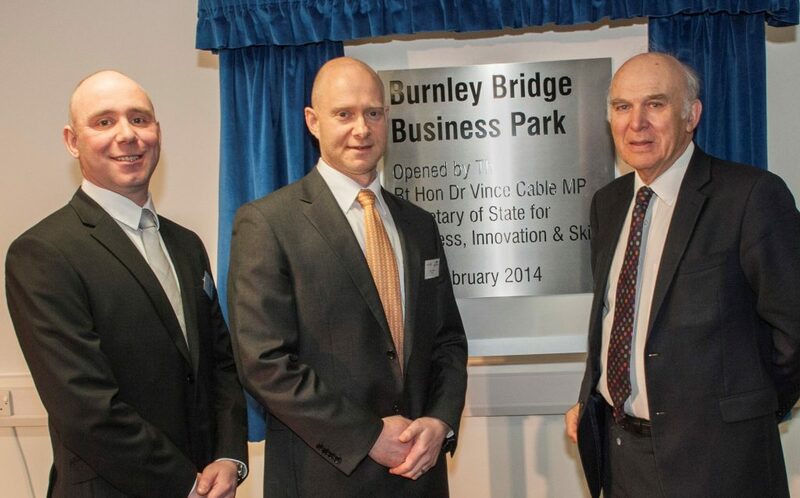 Speaking at the development, Business Secretary Vince Cable, said: “It is seven months since Burnley was awarded the title of ‘Most Enterprising Area in Britain’ and the town has capitalised on that award to drive economic growth and build on its success as a business location. Burnley Bridge Business Park will provide a high standard of industrial and logistics accommodation with units available from just 2,000 sq ft. Construction of the first phase has been delivered with the help of £3.85 million from the European Regional Development Fund (ERDF) and a £2.4 million development loan from Lancashire’s Growing Places. James Chapman, managing director of Eshton, added: “Burnley Bridge Business Park is a built-to-suit development which provides for the key operational requirements of industrial and logistics businesses, offering bespoke facilities, a superb location and direct motorway access. Burnley Council Leader, Julie Cooper, said: “The council worked closely with Eshton to assist them in bringing forward this Grade ‘A’ development, and it’s wonderful it is now officially launched and open for business. This site will put Burnley firmly on the ‘key regional development sites’ list used by the top commercial property agents, who are seeking large quality sites for their clients.